Save 10% To 60% On Dental Braces By Joining A Discount Dental Plan! What Exactly Does An Orthodontist Do? While your dentist will work on providing exams and fillings for you, orthodontic dentistry will provide for more complex problems especially those that concern the alignment of your jaw and your teeth, such as dental braces. These doctors have been licensed as dentists and often provide dental services that are complete, but they specialize in the care of alignments. Individuals that have certain types of facial or dental irregularities will want to see an orthodontist. They will first evaluate your problem, diagnose it, and can even help to prevent the problem from worsening. Most individuals are referred to them by their family dentists, but this doesn’t have to be the case. You can call on them at any time to handle your concerns. They work with both the young and the old on all types of facial and dental alignment problems. Although many dentists can give you advice and provide for many of the dental concerns that you may have, they don’t specialize in structural problems of the face. These individuals have spent time learning about the intricacies of tooth movement and the development of your facial formations. They have been able to put together the development of these areas and are now experts in the area of the alignment of teeth and jaws. Because they have this expert level of skill, they can provide you with the best treatment for your condition. They also often have up dated technologies that allow for the hardest to see braces and the most beneficial jaw alignment abilities. In their hands, you’ll have the best chance of getting the look that you want and need. Today, with the rising costs of dental insurance, there is no question that visiting an orthodontist can be expensive. However, there are ways to get more affordable dental treatments. It is important to realize, though, that the costs will vary based on your condition and the required treatment, as well as the area in which you live. All good orthodontists will be up front with you about the treatment costs and will offer solutions that may make the process more cost effective. One option that you have to lower your out of pocket costs of orthodontic braces is joining a discount dental plan. Certain discount plans will allow you to receive a substantially reduced rate for this type of care. Your membership card works as a discount card to get you lower rates from participating providers. You can save as much as 60% off the usual cost of braces by joining one of these affordable plans. 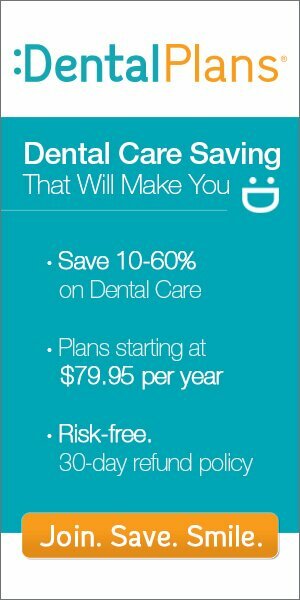 Will Dental Insurance Pay For The Costs? No. Dental insurance does not normally pay for Orthodontic braces. Braces are actually a form of cosmetic dentistry, and you won’t receive coverage for them in a standard policy. You can buy a plan specifically for dental braces. However, these plans only cover a maximum of 50% of your costs and have a low annual maximum coverage amount. An example of this would be in the range of $1000 annual coverage for an individual and $2500 for a family. This means that if your costs are $5000 then you will have to pay the rest on your own. Orthodontic braces are included in most discount dental plans so there’s no need to buy an Orthodontic insurance policy. You will save from 10% up to 60% off your costs and there is no annual limit placed on your plan. For more information, or to find a participating dental specialist near you, enter your zip code Right Now in the light blue box at the top of the page or call us Toll Free at 1-855-214-7725. You can be on the way to getting your Orthodontic braces within one to three business days!